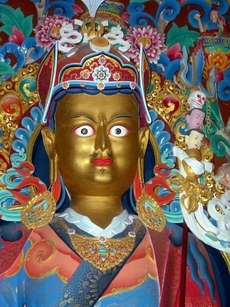 The Nyingma Tradition originates from Buddha Padmasambhava, who came to Tibet in the year 817 CE (AD) at the request of Chögyal Trisong Détsen. Padmasambhava—in collaboration with Shantarakshita and Trisong Détsen—built Samyé monastery, which became a principal centre of learning and the site where many of the texts that would make up Tibet’s vast Buddhist literature were first translated into Tibetan. Padmasambhava is the Tantric Buddha – the second Buddha, who brought the teachings of the Nine Yanas of Buddhism to Tibet and the entire trans-Himalayan area. He founded the two sanghas: the red sangha of monks and nuns, and the gö-kar chang-lo’i dé, the white sangha or ngak’phang sangha of ngakpas and ngakmas, naljorpas and naljormas. Padmasambhava gave widespread teachings of the three Inner Tantras to Yeshé Tsogyel and to his twenty-five principal disciples. 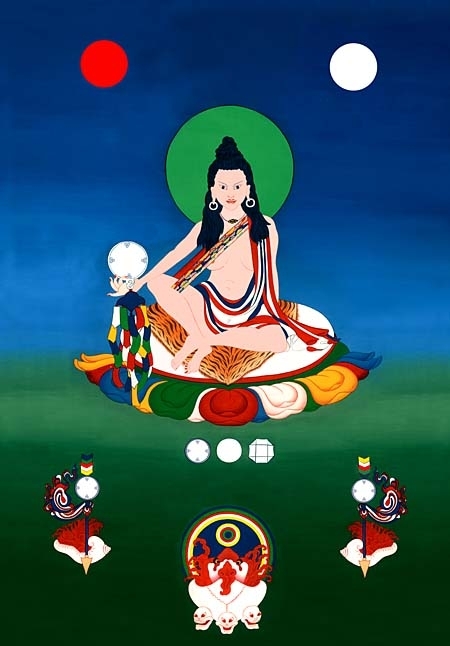 These first Tibetan siddhas are renowned for their spiritual accomplishments. Aro is a Tibetan Vajrayana Buddhist tradition whose unusual characteristics make it singularly appropriate for many Westerners. Aro is principally concerned with transforming our experience of everyday being, rather than achieving an esoteric or spiritualised mode of existence. Our aim is to engender cheerful courage, perceptive consideration, sincere determination, natural gallantry, graciousness, creativity, and spaciousness. The Aro teachings descend from a lineage of enlightened women – beginning with Yeshé Tsogyel. She was the female Tantric Buddha, who—together with Padmasambhava—founded the Nyingma tradition of Buddhism. Aro is a small family lineage within that tradition – founded by the female visionary Lama Aro Lingma in 1909 (picture left). The Aro Lineage Lamas are Ngak’chang Rinpoche and Khandro Déchen, a married couple with one daughter, who live in Penarth, South Wales. The lineage sangha is very active in providing a huge amount of information on the Internet, using a range of media and offers audio instruction and a free on-line course in meditation. Monday evening practice alternating Yogic song and silent sitting, on the second and fourth Monday of each month 7.30p.m.—9.00p.m. No previous experience of Vajrayana practice or meditation is needed. We can intersperse discussion with practice to assist anyone new to the style of practice. Sessions are in the home of apprentices to Lamas of the Aro sangha at 22 Clarence St, Penzance. Occasional sessions will be held at 10, St. George's Road, Hayle. email dates of events Also contact. In Sutric dön-pa it is the meaning of the words which is the focus. In Tantric dön-pa the words are used as a guide to visualisation. The melody is employed in order to give power to the words – to animate them. Yang or Dzogchen Gardang are terms we usually translate as yogic song. There is no translation in English for these words as they do not equate to anything within Western religions or spiritual traditions. With yang there is no concept – it is a Dzogchen practice. The primary function is finding the presence of awareness in the dimension of the sound. For this transmission is required, both for the method and for the vajra melody of the yang. more on Yogic song. Meditation, or “silent sitting” can take different forms depending on the practitioner’s development. We start with Shi-nè: a process of allowing any thoughts to arise, then letting them go. This is repeated continuously throughout the period of silent sitting. Guidance will be given to approach Shi-nè from different directions. The dictionary item on Shi-nè gives further explanation and depth. at The Chaplaincy Cottage, Falmouth University, Penryn Campus, Treliever Road, Penryn, TR10 9FE. The Chaplaincy can be found at point 11 on the map, car park close by. The practice of Sky Weaving is called ‘Namkha’ in Tibetan, which means ‘sky’ or ‘dimension’. This meditation practice involves weaving ‘skies’ of coloured wool, which link our energy with the energy of the elements, through the Tantric craft of sound and vision. The beauty of the Sky Weaving, which is empowered through mantra, magnetises personal ‘demons’ (neuroses, fears and obsessions) and releases them within the skies of each element. In Tantra we talk of the ‘skies’ of the five elements; earth, water, fire, air and space. Each element is a sky (dimension) of meaning, and each element is associated with an emotional confusion and a liberated energy. During the day you will make your own skyweaving under the guidance of Ngakma Shé-zér. Aro Ling is a Buddhist bookshop and meditation equipment supplier, offering teachings and retreats at Benjamin Perry Boathouse, Phoenix Wharf, Lower Guinea Street, Bristol, BS1 6TJ not far from Bristol City Centre. Aro Ling is an idea: that openness and appreciation – life and art – are inextricably intertwined, and that the process of discovering that fact can be a joyful one, shared with friends.